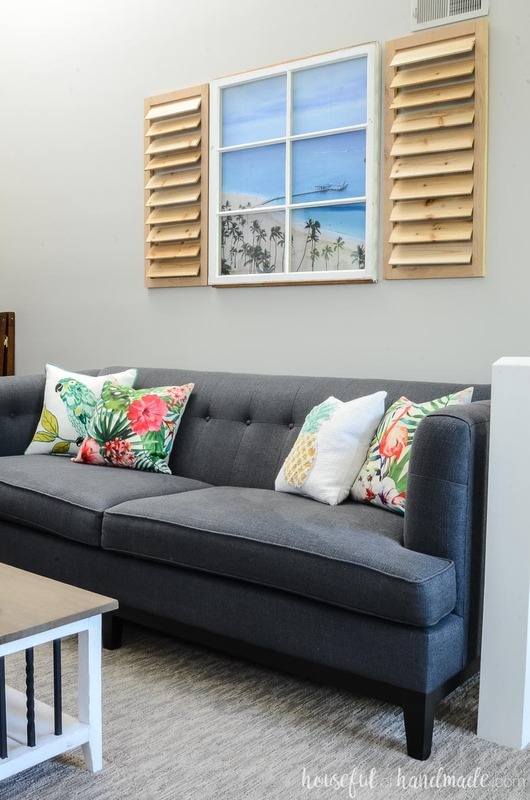 Create a tropical living room so you always feel like you are on vacation. 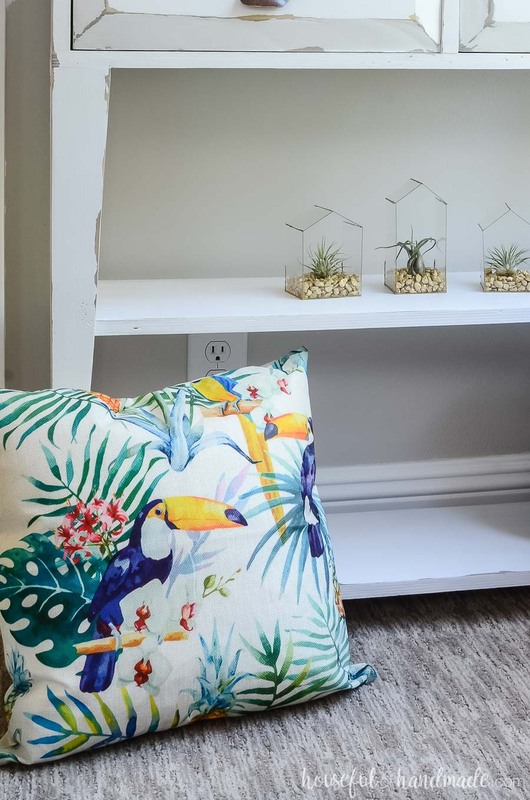 It’s easy to add some tropical home decor and create a beautiful tropical oasis at home. 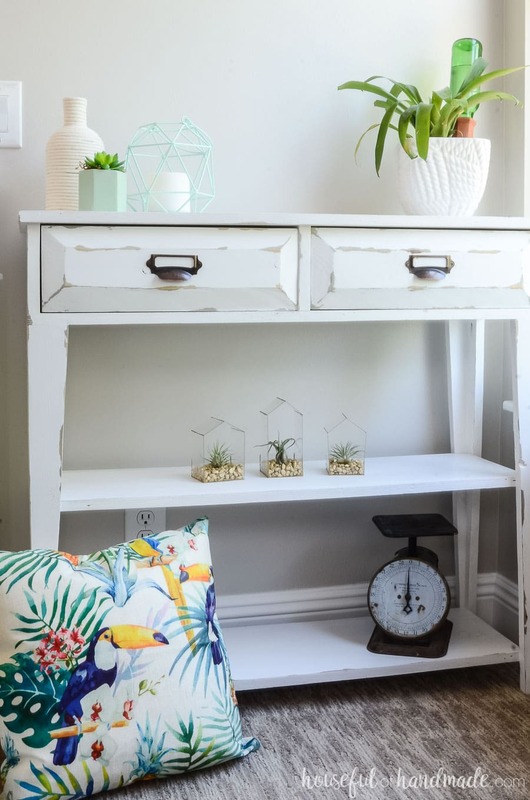 Summer can be such a fun time to decorate. I like to think of summer decor as a vacation. No rules apply! So this year I went “on vacation” with our decor and added lots of tropical accents. Now we have a tropical living room and I can’t wait to share it with you. 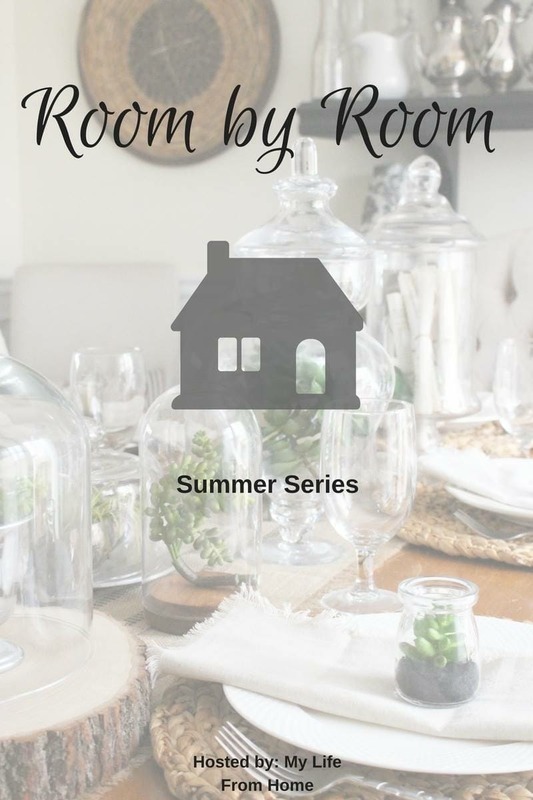 I’m so excited to be participating in the Summer Room by Room series hosted by My Life from Home again! 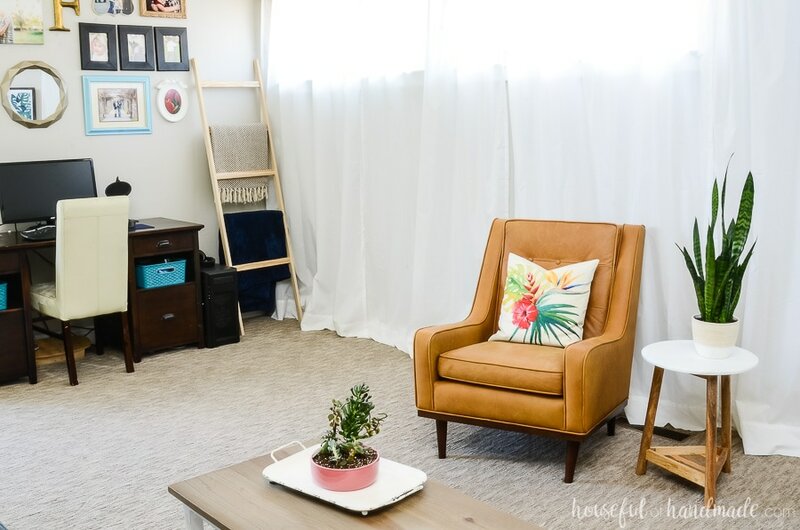 Each Thursday for the next 6 weeks we are going to share a room in our home, all decorated for summer. 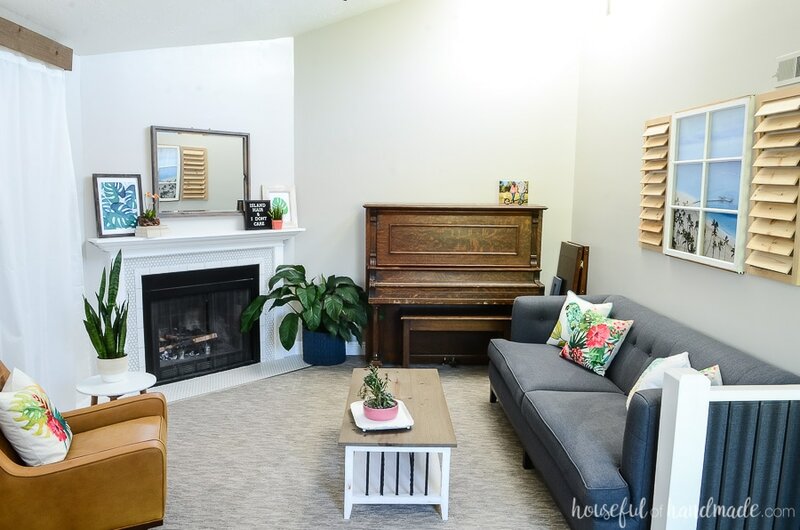 Check out my summer living room tour below and at the bottom, make sure to visit the rest of the beautiful summer living room tours too. Whenever I decorate (or redecorate) a space I start by shopping my home. It really helps to keep things on budget. 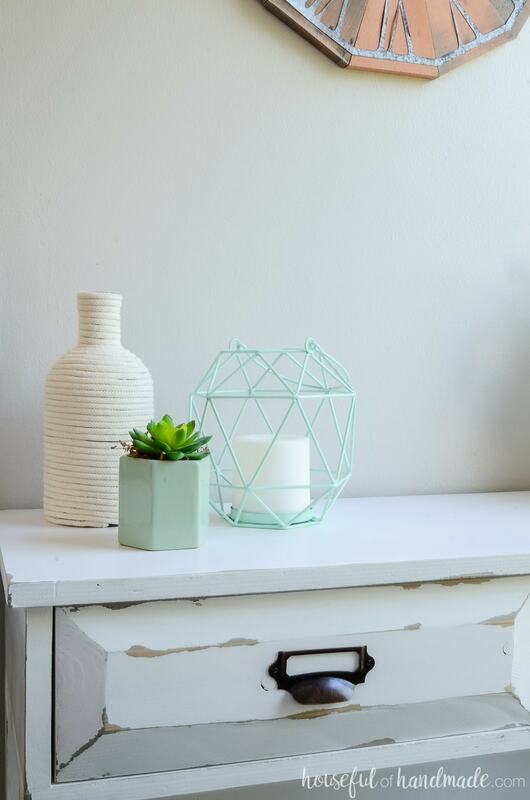 Look for accessories and trinkets that will work in the space. 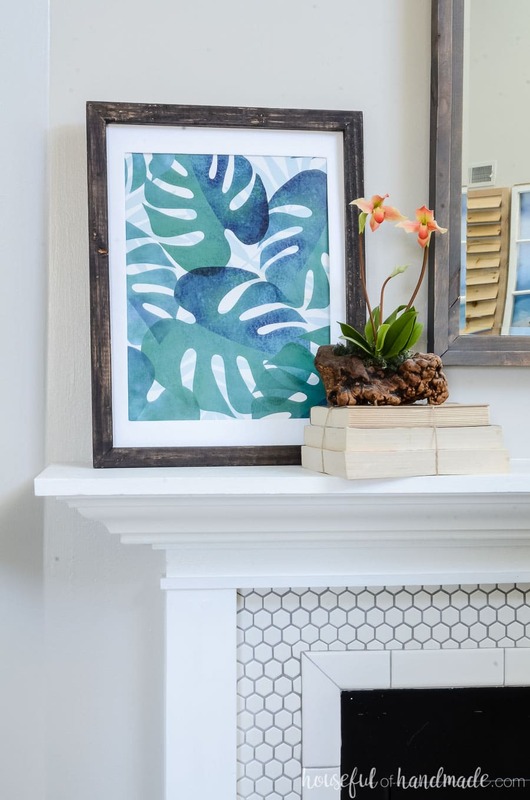 For our tropical living room, I looked for things with bold colors and a tropical vibe. 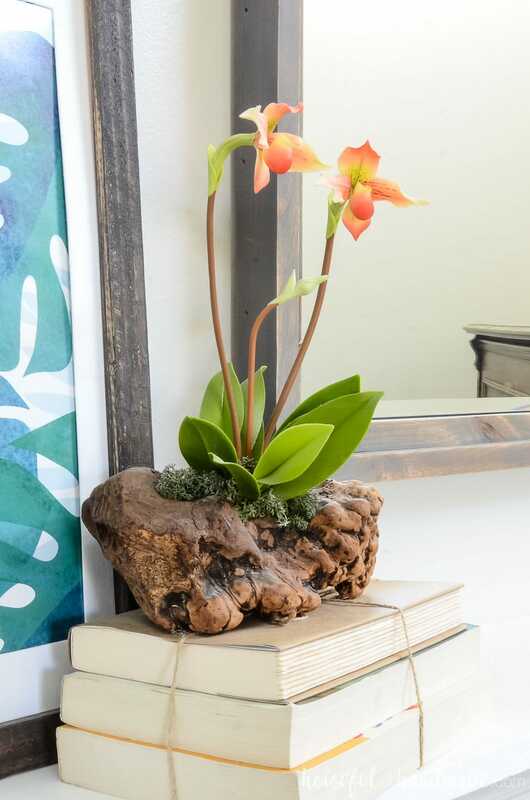 And the first thing I found was this coral orchid scuplture we bought on our first trip to Hawaii. It was the perfect jumping off point for our tropical decor. Next, it was time to add some printables! 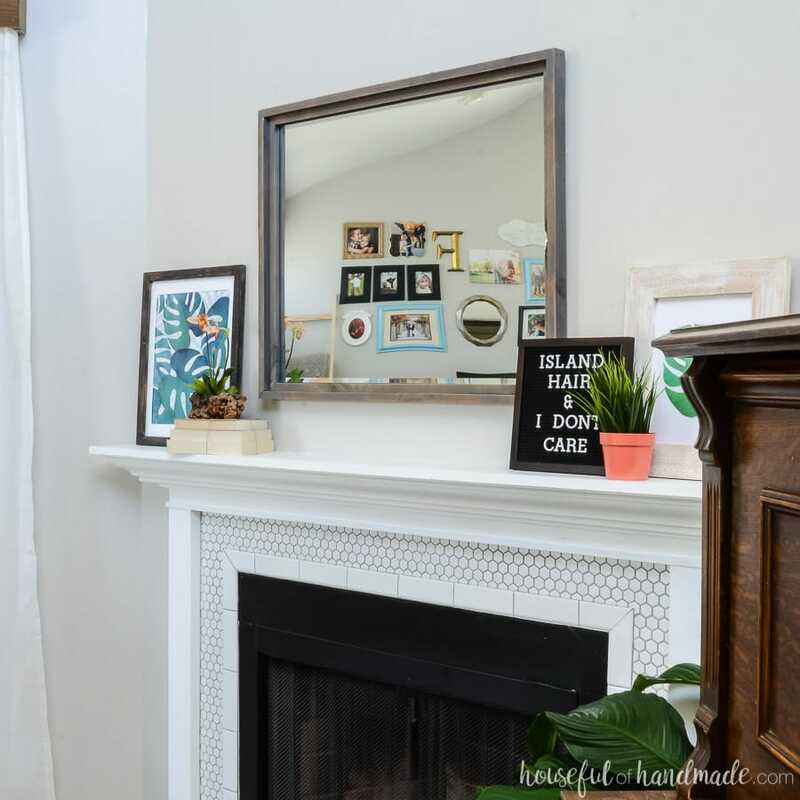 Printables are another wonderful budget decor tip. I wanted something big and bold and tropical. And since I had just made a print for the June digital backgrounds that was exactly that, I turned it into some Free Printable Tropical Leaf Prints. Then I printed a couple of them and added them to some 20 minute rustic picture frames I made a couple years ago. It was starting to look like a tropical living room. Above our sofa, I already had the old window on the wall. It didn’t really look very tropical. But I didn’t want to remove it (it’s a pain to store). Instead, I decided to dress it up. What’s more tropical than some cedar shutters? I love the shutters that you see on all the beach front homes. They make things look so tropical, like a storm could come off the water any minute. So I decided to recreate this look by adding some decorative shutters to either side of our living room window. 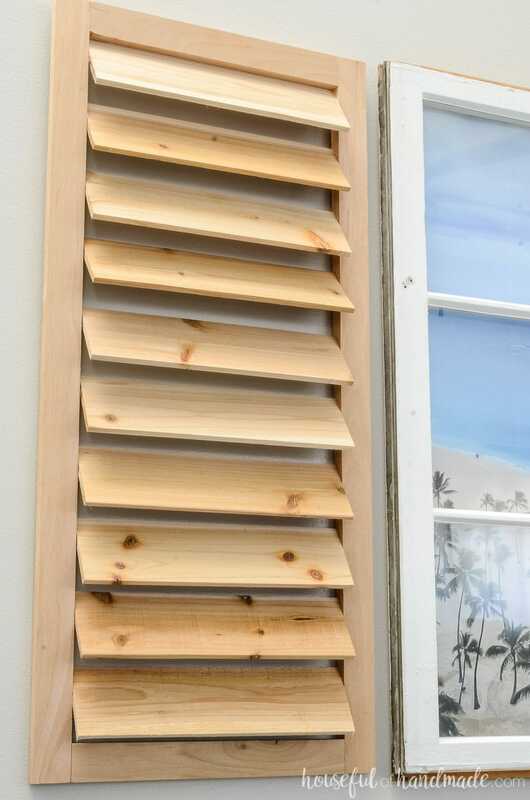 The decorative shutters were made with cedar tongue and groove boards and some 1×2 scraps from my shop. They cost me nothing to build (how’s that for budget?) and freed up some space. I’ll be sharing the tutorial soon so you can make some easy decorative shutters too! After hanging the tropical shutter though, the window still didn’t look tropical. It was better for sure, but something was missing! So I printed off a picture from our recent trip to Hawaii and taped it to the back of the window. Now it looks like I am looking out over the surf while drinking my coffee in the morning. Perfect! 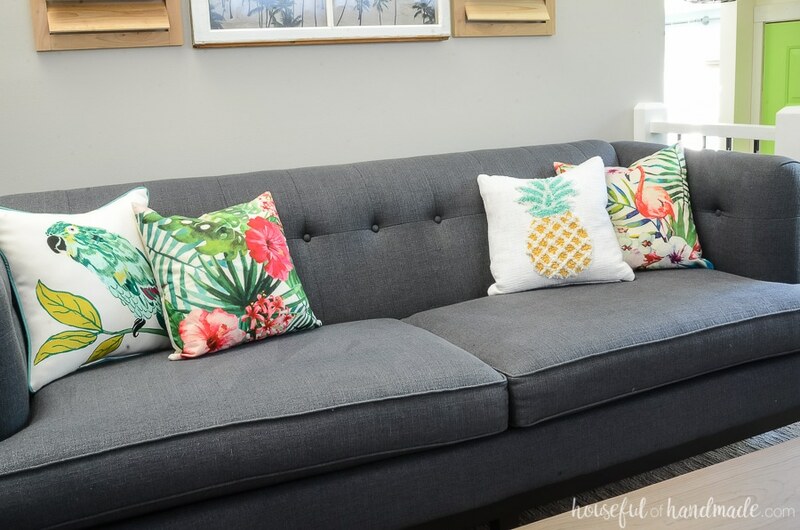 Another really easy way to add tropical living room decor was with some tropical pillows. Whenever I want to change out pillows in a space, I try to find pillow covers (or make them!). 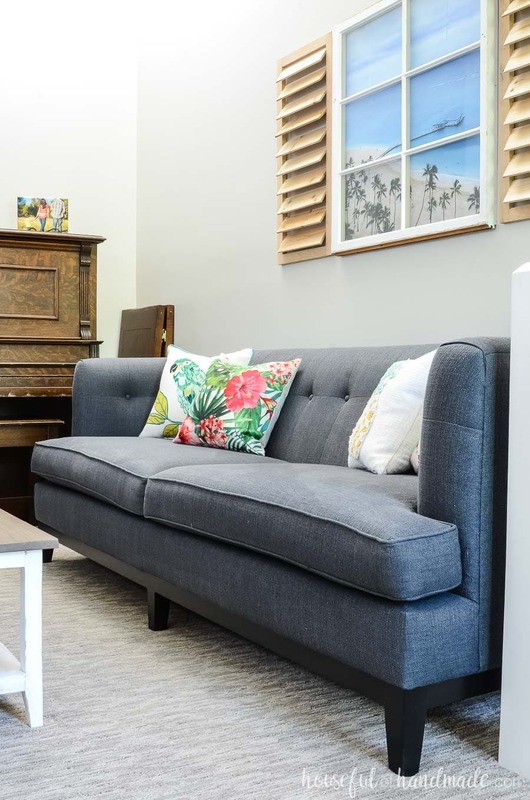 Pillow covers are usually half the price or more of buying pillows, and when you are ready for a change, you can hang on to the pillow insert and just store the tiny covers for later. I started with this 4 pack of tropical pillow covers. They were perfect for adding lots of tropical colors. But then while shopping at Target and Home Goods, I came across the parrot and pineapple pillows. They were such a good deal, I couldn’t pass them up. 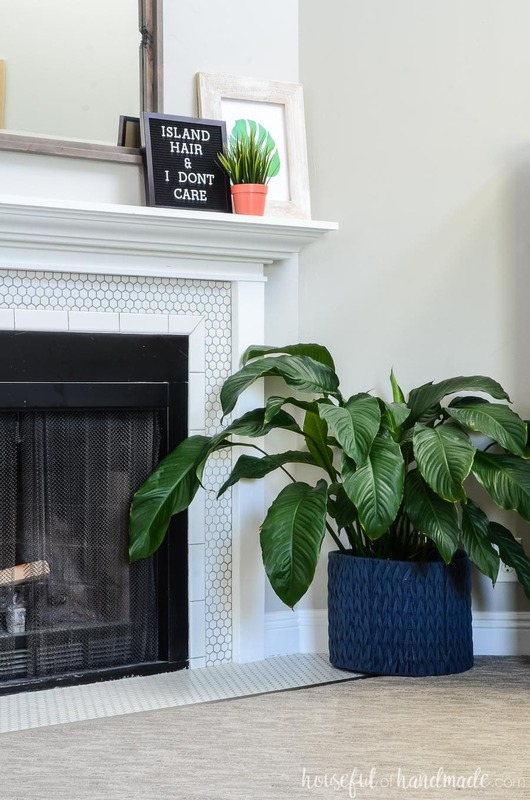 One thing a tropical living room really needs is lots of tropical plants. Thankfully I was already covered there! I bought the Day Lily last October and cannot believe I have managed to keep it alive for almost a year! Then this spring I added the snake plant which seems to be even harder to kill. Bonus! And a few succulents in a pot make this tropical garden low maintenance but beautiful. I just love how our tropical living room turned out. It’s the perfect space to relax at the end of a summer day. Here are a few more pictures of our incredible space. 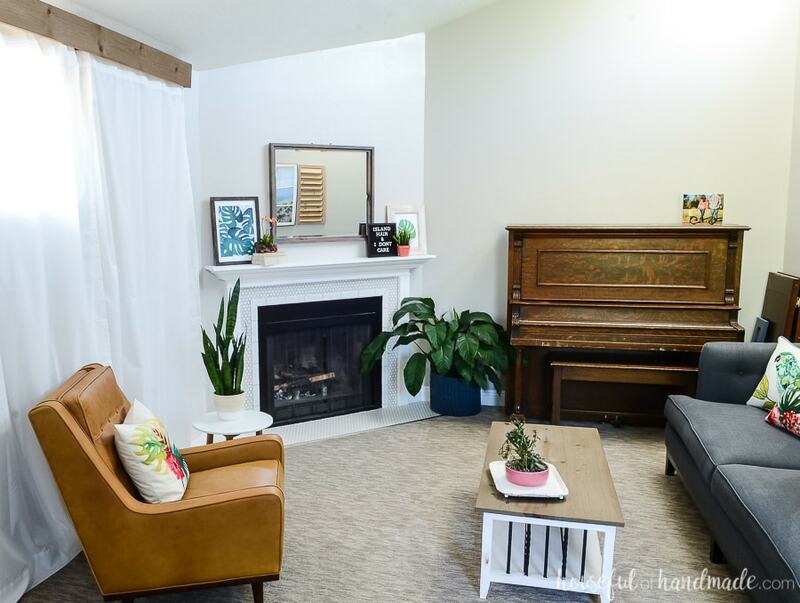 And then don’t forget to check out the rest of the summer living room tours! Your living room looks so beautiful. All the colors are so pretty. Thanks for the inspiration. It looks like a tropical paradise not a living room! You did amazing job and you home looks lovely. This is so fun!! What a great makeover. I love the addition of the shutters as well. Can’t believe you made those! Thanks for hopping along! Thanks so much for the fun tour series Amy! Oh, I love the tropical feel in your room. Those shutters are so cute next to the frame for a window look. LOVE! Great job. Thanks BonBon! The shutters turned out so fun. Perfect place to enjoy a tropical drink and pretend I’m on vacation! 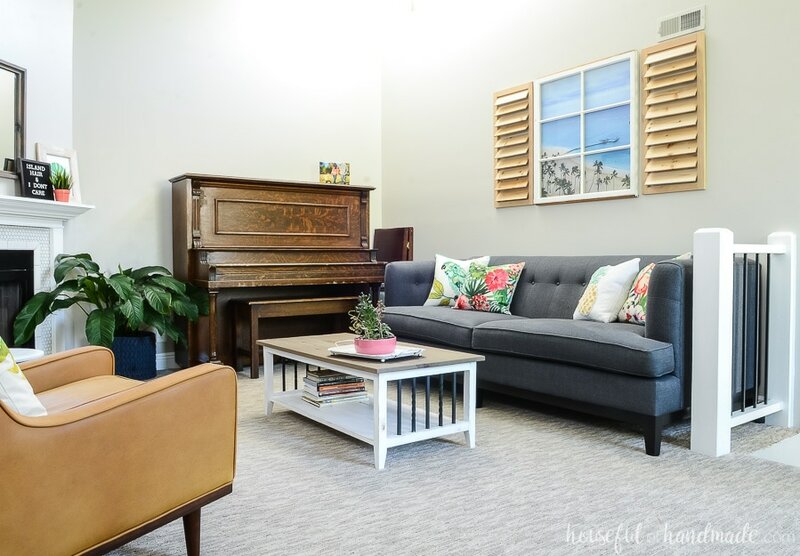 Your living room is so bright and cheerful for summer! The shutters are such a fun touch! And, I definitely need that Island Hair Don’t Care sign, haha! Thanks Samantha! I love how it turned out. This does feel like vacation! 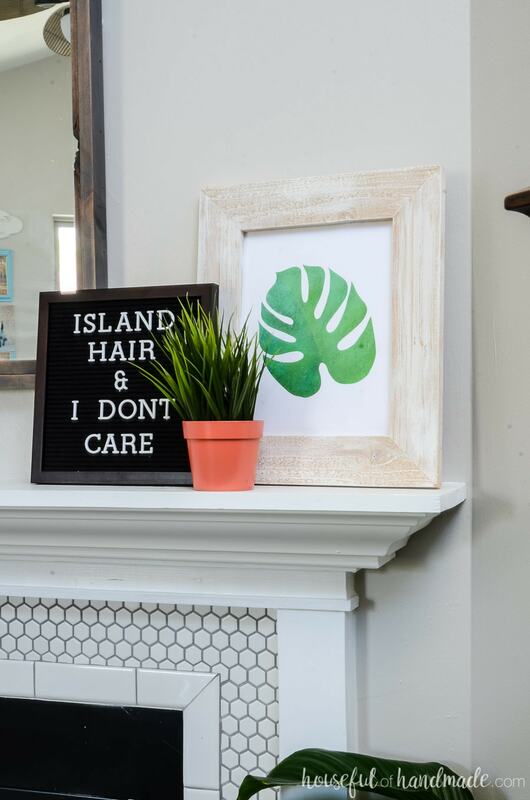 We love all of your personal touches “Island hair & I don’t care” is super cute and fun! 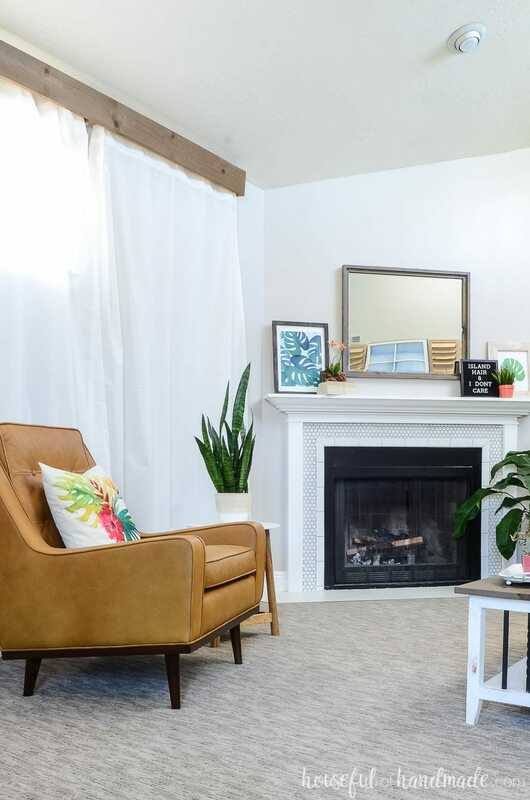 You perfectly showcased how to bring summer decor into your living room without breaking the bank!